George Howard Wilkinson was Bishop of Truro and then of St Andrews, Dunkeld and Dunblane, in the last quarter of the 19th century and the early part of the 20th. 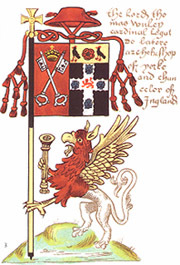 Philip Repyngdon (or Repington, or Repyndon) DD, CRSA (c. 1345 – 1424) was a bishop and cardinal. John Alcock (c. 1430 – 1 October 1500) was an English churchman. The Bishop of Clonfert is an episcopal title which takes its name after the village of Clonfert in County Galway, Republic of Ireland. Alured (or Alfred) was a medieval Bishop of Worcester. Alured was a clerk of King Henry, probably Henry II of England. He was consecrated about 13 April 1158. He died on 31 July 1160.